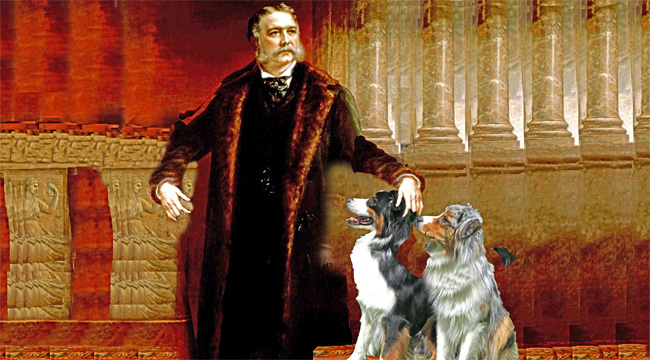 CHESTER ARTHUR ON CROSSCURRENTS, 10/5 – Doggedly Yours… Howling, Humor, and History. CHESTER ARTHUR ON CROSSCURRENTS, 10/5: Becoming the 21st U.S. President under a cloud of distrust, he left the office generally respected as trustworthy and dignified, Chester Arthur was born on this date in 1829. Gavin and Wyatt get a pat on the head from President Arthur though hope for biscuit patronage. You can rely on an honest and dependable show when John celebrates Chester Arthur’s birthday on Crosscurrents, 10/5 at 8 a.m.
Not as boring as one might think… Of course I am an old civil servant bureaucrat like Chester.